The Vikings Sailing Club now has new facilities enabling it to continue with its training facilities and to continue fostering a love for yachting, especially amongst children and youths. The Government has provided new facilities for the club which had to move out of its Floriana Haywharf premises because the area was required by the Armed Forces in line with an EU funded project for the country's maritime squad. Since its establishment in 1984 as a club for amateurs, the Viking Sailing Club moved rapidly forward to promote the sport of yachting. During a visit by the Parliamentary Secretary for Sport Chris Agius, he expressed appreciation that the club had accepted having to forfeit its premises for the needs of the maritime squad. He said it had not been an easy task to provide alternative premises that were close to the sea to facilitate the launching of boats. However, obstacles had been surmounted because of financing by Yachting Malta together with the commitment of volunteers and this had resulted in a suitable alternative. 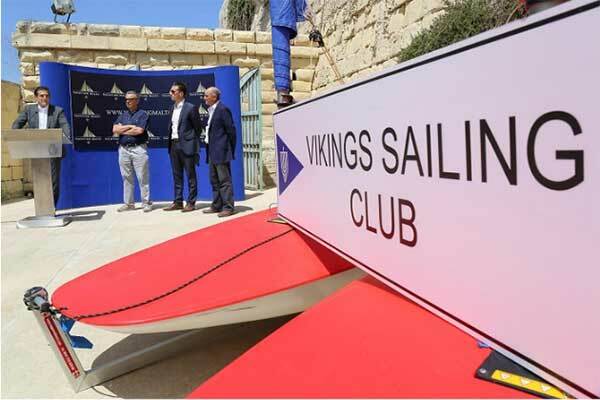 As a result of the intervention of Yachting Malta with the collaboration of the Malta Yacht Club, the Vikings Sailing Club can now easily launch its vessels to continue giving maritime lessons in line with Skolasport 'On the Move'.